I have a confession to make: I’ve never cooked with sesame oil before. I have another confession to make: cooking Asian food intimidates me. But last week I was feeling gutsy, so I decided to try my hand at something I love to order when I’m out out (or buy from the prepared foods vegan section at Whole Foods). I decided to make Japanese-style Spicy Soba Noodles. And feeling even more adventurous, I cooked with not just one but two (!) types of sesame oil. Ever had soba noodles before? It’s made from buckwheat and is a popular Japanese dish, served either hot or cold. For my first attempt, I used a spicy sesame oil infused with chili peppers plus a dark roasted sesame oil. Both exude the most mouth-watering aromas and enveloped my dish with a flavor depth I associate with restaurant-quality food. I love the texture contrasts in Japanese food, and I also appreciate how pretty most dishes look.If you’ve ever eaten at a nice Japanese restaurant, you’ll know what I mean – some of the dishes almost look like works of art! Beautiful slice of sashimi, artfully arranged bowls of ramen, fanned out pieces of vegetables, and adorable desserts, everything looks carefully composed. Then I sprinkled a generous amount of cilantro on top to finish the dish. The end result is a bright and fiery soba dish. I’m really glad I branched out of my comfort zone of cooking dessert and pasta. Although now that I think about it, I can easily sub in whole wheat pasta for soba anyway… But for now, I’m savoring my Asian concoction! Stir together all sauce ingredients until brown sugar is dissolved, then set aside. Heat oil in skillet over medium-high heat until it shimmers, then sauté ginger and garlic, stirring, until fragrant, about 30 seconds. 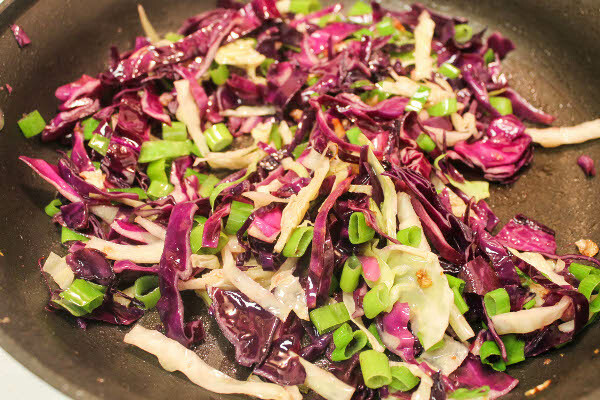 Reduce heat to medium, then add cabbage and scallions and cook, stirring occasionally, until cabbage is crisp-tender, about six minutes. Add carrots and sauce and simmer for two minutes. While cabbage is cooking, cook soba according to package directions. 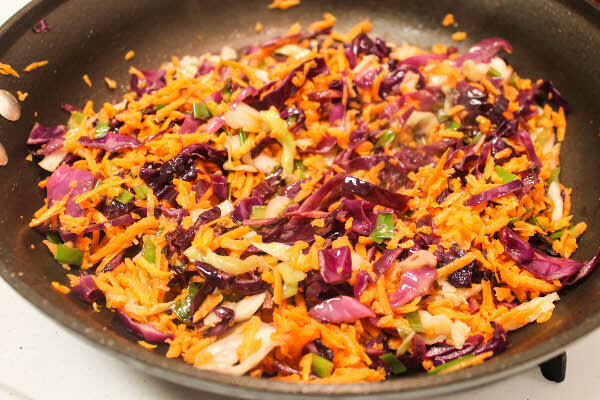 Drain in a colander and rinse under cool water to stop cooking and remove excess starch. 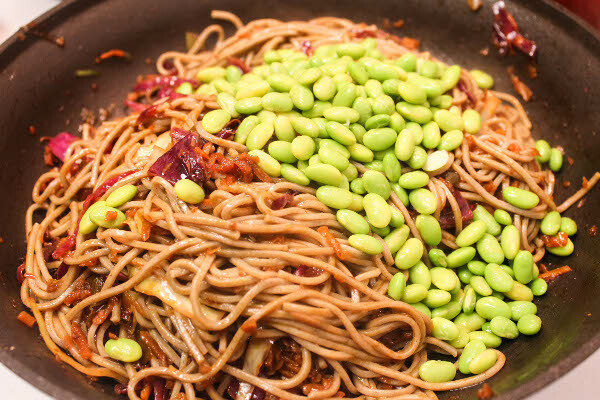 Add noodles and edamame to vegetable and sauce mixture in pan. Toss well and serve with chopped cilantro. Warning: this is SPICY! As in my mouth is burning after a few bites spicy. 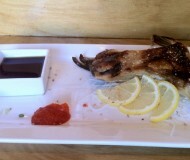 It is whoa I had a heavy hand with that chili paste and infused sesame oil spicy. But also, this is so addicting, I can’t stop eating it spicy. It’s that kind of spicy, that kind of good. We always have sesame oil on hand. It lends such great flavor to dishes. I love spicy, and this looks amazing! This dish looks AWESOME! Way to conquer your fears! I love sesame oil! I’ve used it ever since I was little to make easy peanut noodles. I would seriously be in love with this dish. Spicy peanut noodles is next on my list! I started using sesame oil (also for the first time) last year in my stir fries. I could not believe the difference in taste! You know how sometimes you make something and it is just missing…something. Well, for my asian dishes it was sesame oil! Yes! I’m so glad I started using sesame oil, I really like the spicy one! I love spicy noodle dishes. These look so good — all that color! Hey Tiffany! I bought all the ingredients at Whole Foods (from the soba to the sesame oil to the chili garlic paste) but I bet other grocery stores also carry soba in the International Foods section! I’ve never cooked with soba noodles OR sesame oil before. Thanks for the recipe! this looks amazing. I am intimidated to make asian food, too! Thought that’s a surprise to hear coming from you!! I made one soba noodle dish a while ago and have been wanting to cook with them more. While this is clearly too spicy for me, it’s giving me good ideas! I have never cooked with soba noodles before! But it won’t be long cause I can’t wait to make this! I adore sesame oil. Asian flavors are my favorite to cook with though. This looks amazing, Biacna! 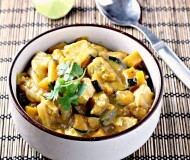 I love the colors, and I definitely need to make this if its as spicy as you say! I love cooking with sesame oil! I have almost all ingredients on hand to make this, will have to give it a try. Eating spicy noodle soup right now, love the heat! 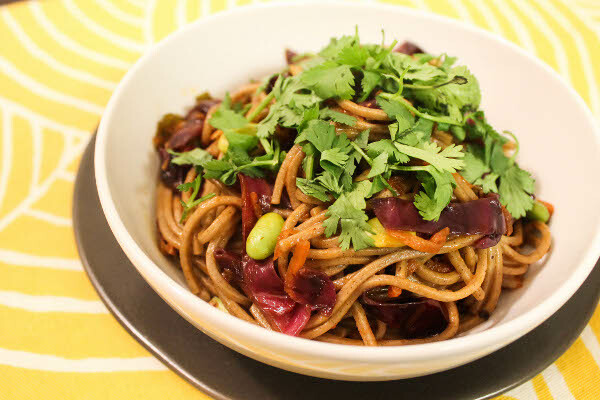 Soba noodles are delicious, so this dish is right up my alley! Noodle perfection. I love the flavor profile. Soba Noodles are my favorite!! this recipe sounds like a winner! I love sesame oil, and I agree that smell is enough to get you salivating :) My husband actually eats spicy noodles so I will have to give this version a try. I love sesame oil, specially for dressings, of which I made one yesterday. I saw chili paste on the supermarket the other day and was wondering what I could do with it. 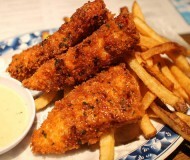 This looks like a plan, they look delish. And I looove spicy and burning my mouth. Oooh sesame oil dressing sounds fantastic! Dude. Nice work. This looks unreal, forreal forreal. haha i love when things are so spicy that you just can’t stop even though you’re in pain. looks delicioussssssss.. i love japanese food. i’ve heard sesame is used as a finishing oil rather than a cooking oil, but i use it as a cooking oil for asian dishes. very nice job. These noodles look great. We love spicy food, especially my husband, so I bet we would love this dish. 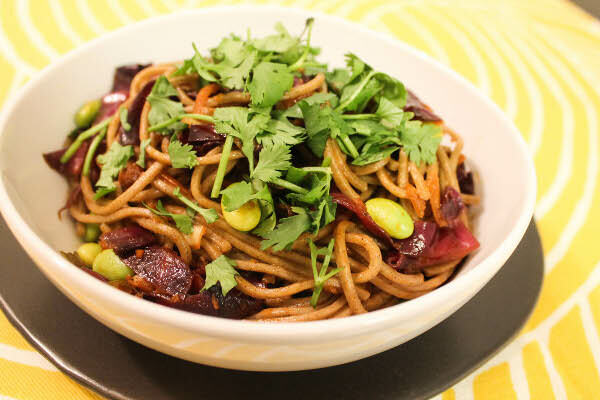 I love both soba noodles and sesame oil – it’s just so flavorful! Looks like a lovely spicy meal! I’ve never had soba noodles before, but really want to try them. Maybe with a bit less spice! ahh i adore sesame oil – almost as much as coconut! Where’d you find the chili infused kind? So colorful and pretty! I would eat this any day of the week. And you’re right about sesame oil – it adds such tremendous depth, and a little goes a very long way! I love trying recipes like this! 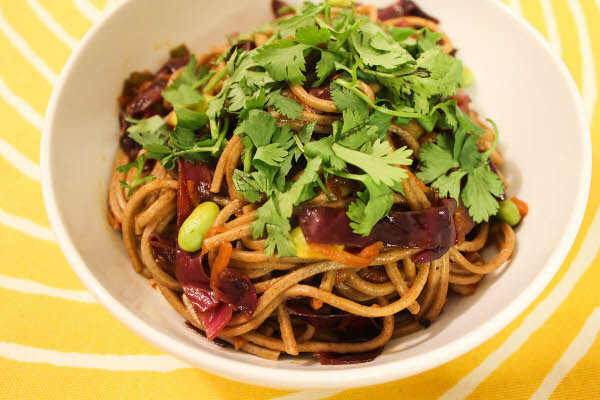 Soba noodles are so tasty, and your recipe is lovely! I’m glad you went outside your comfort zone and cooked something Asian inspired. Welcome to my world… i hope you continue to explore other Asian flavors as well. your first try looks so good..